Recently I learned that the peacock is the symbol for the fifth energy center in the human body, the throat chakra. It is located at the center of the neck and resonates with the vibrational frequency of the color, blue. The throat is an important instrument of communication and expression. Sound vibration in the throat can be felt not just in our ears, but through our whole body. 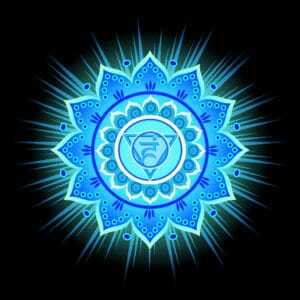 This chakra represents our power; the power of choice and the ability to express who we are and what we feel. Unbeknownst to me, there are quite a list of gods and goddesses associated with peacock: the Greek goddess Hera and god Argus, the Hindu gods Shiva and Indra, and the Hindu Lord Krishna. Legend says that when the Hindu god Shiva, swallowed and purified the poison of the primordial ocean his throat turned peacock blue. We often think of what we send out from the throat chakra, but what about what we swallow? Consider swallowing the poisonous words you think before they come out of your mouth. They can be reclaimed and transmuted with the breath and chakra system into light energy. As a writer and teacher, I practice transmuting words into energy patterns aimed towards reaching greater consciousness. As I choose my words carefully, my understanding of the peacock’s spiritual meaning grows larger. 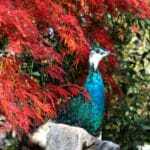 I discovered in researching this post, that the peacock is also the Emblem of the Jewish Deity ELI and His Royal House, of King David and King Solomon. It represents Jerusalem, Judah, Israel, Judaism and even Jesus Christ. The Christian Messiah was a decedent of the royal house of David. The eyes of the peacock feathers symbolize true perception and knowledge of God as He truly is. Symbolic of seeing the Great I AM through contact with Angels, the Christ Consciousness, and Oneness. Direct contact is made through stacking the colorful column of light of the energy system (chakras). There are many theories as to why the peacock has such a huge ostentatious tail. The tail is clearly a heavy burden when fleeing a predator, making flying difficult. Plus, this display takes an incredible amount of energy to produce. Every fall, a peacock loses his entire tail in a matter of days and grows a new one every winter. It is a symbol of regeneration and immortality. As a symbol of integrity, the beauty of the peacock indicates what we can achieve when we endeavor to show our true colors. Authenticity is our greatest power for creation. Now is the time to follow the peacock’s example and GO ALL IN. In your own life, ask yourself, how can I swing for the fences? What we accomplish in this amazing time of transition into a new age and new dimension, will be immensely bigger than we could have ever imagined possible. Remember the peacock, flash your true colors, speak your truth! Lindsay Godfree is a successful author and teacher who was struck by a supernatural experience of transformation and awakening. Her mission is to inspire others with her story and guide them on a journey of authenticity and consciousness. Read her story here.